During a recent trip off the coast of Scotland in search of deep-sea sharks, I went into the trip already with an idea of the species of sharks that we were going to enounter. 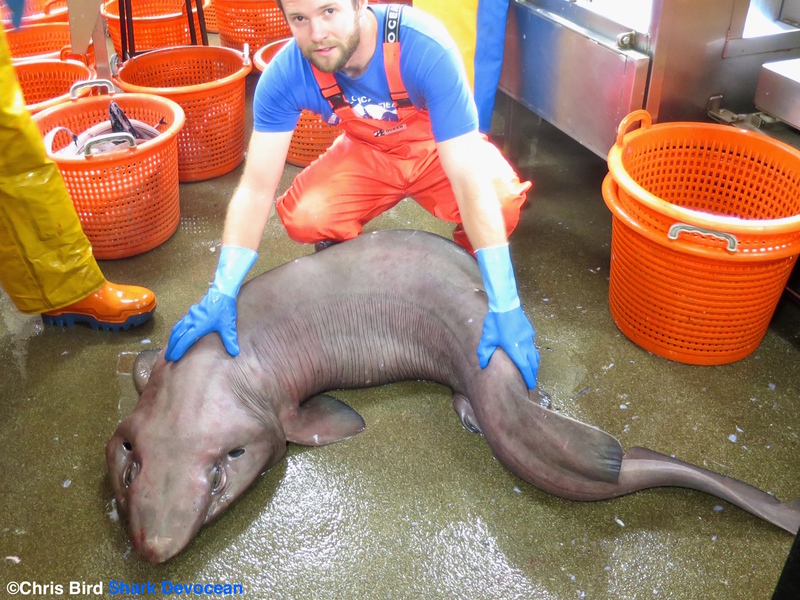 I had heard of a few rare species of shark that occur in the Northeast Atlantic Ocean, but never did I expect that we would see any of them. Imagine my delight when we caught not one, but two extremely rare sharks. 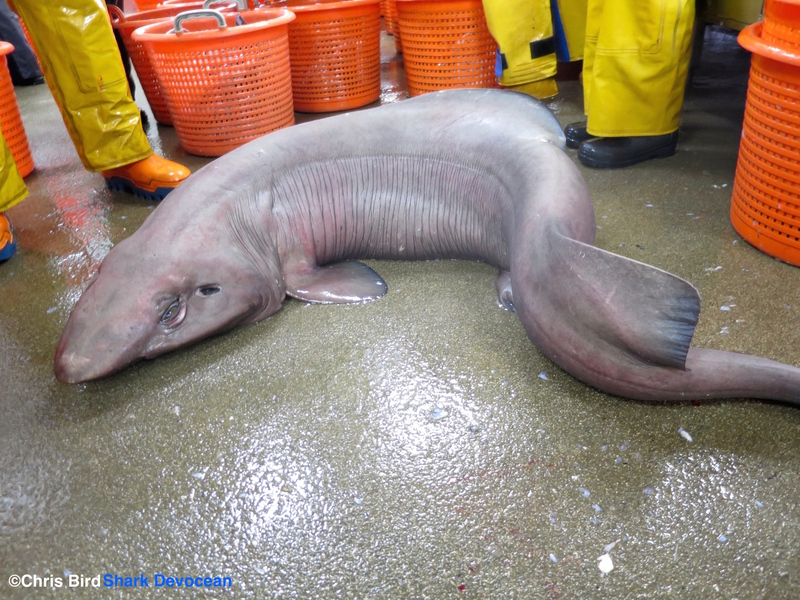 Alien deep-sea sharks by their very nature are truly bizarre in appearance. Lurking in the dark depths of the deep-sea, many have large menacing eyes, ominous black colouration and some species are even able to glow in the dark. Whilst we are now beginning to increase our understanding of some of the more common species, there are still species that are so rarely seen, that we have very little, if any, knowledge of even their basic biology. The sailfin roughshark, Oxynotus paradoxus, is very rare in these waters and throughout Europe. This is a 76cm Male. 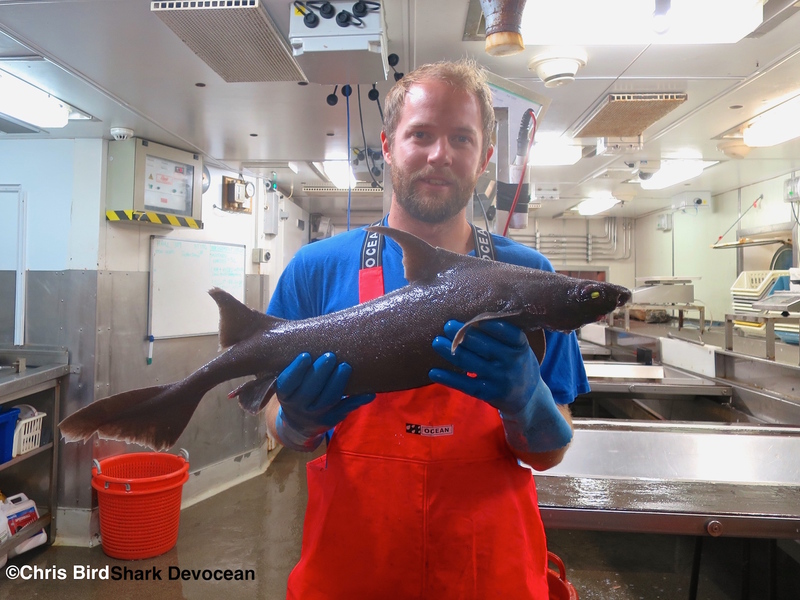 The first rare shark caught during this trip was the Sailfin roughshark, Oxynotus paradoxus. More reminiscent of an 18th century sailing ship than a shark, the unique large dorsal fins of this shark made this shark instantly recognisable. The sailfin roughshark we caught was at 500m and is in line with their known depth distribution between 265m and 725m. 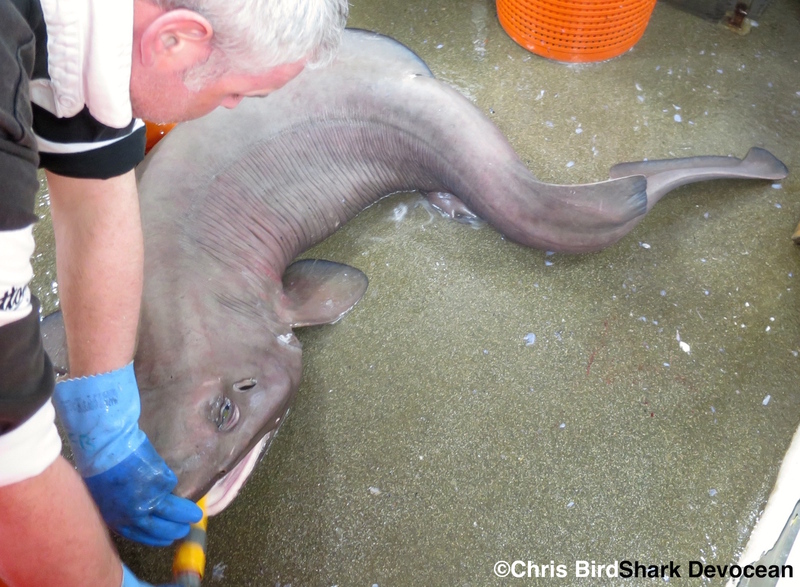 This shark was a male and had a total length of 76cm. With it’s distinctively high dorsal fins and rough skin, this species looks more ship than shark. The shark belongs to the Oxynotus group of sharks, more commonly known as the rough sharks, due to their large rough denticles. They have exceptionally large dorsal fins, a peculiar flat/ angular underside and incredibly large spiked denticles. Their mouth is very small and located on the underside of the head and surrounded by large lips. A recent study uncovered that this bizarre mouth was used to feed exclusively on the egg cases of other sharks, skates and rays. Once all measurements and samples were recorded, the shark was returned to the ocean. The first rare shark catch was exciting enough and many of us that are familiar with sharks were thrilled we were able to see one. Knowing that rare sharks were out there, I was ever optimistic at seeing another rare species during the trip. Little did I know that the next rare shark surprise would come the very next day and it was massive! 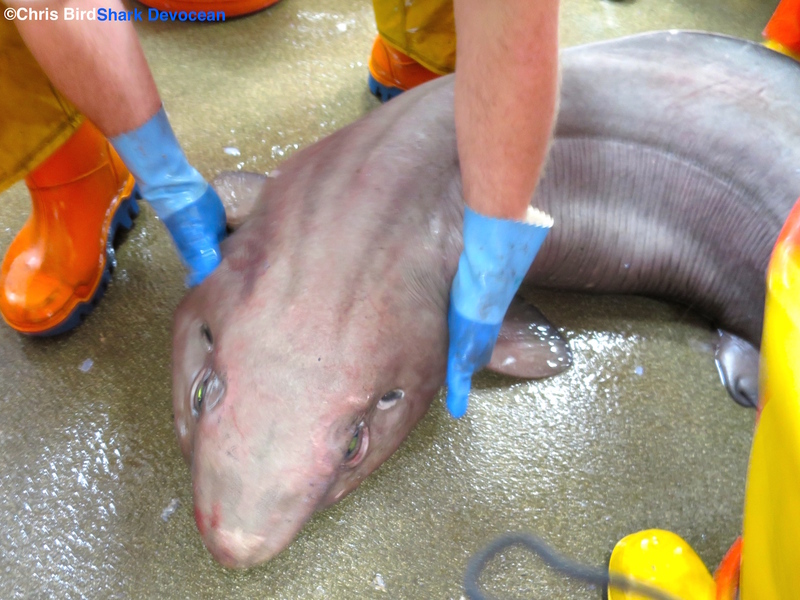 A false catshark of this size has never been seen in Scottish waters before. Most of the sharks caught in the deep-sea are typically less than 1m in length, with a few of the larger species reaching 1.3m. This next shark entered the fish house and took us all by surprise. 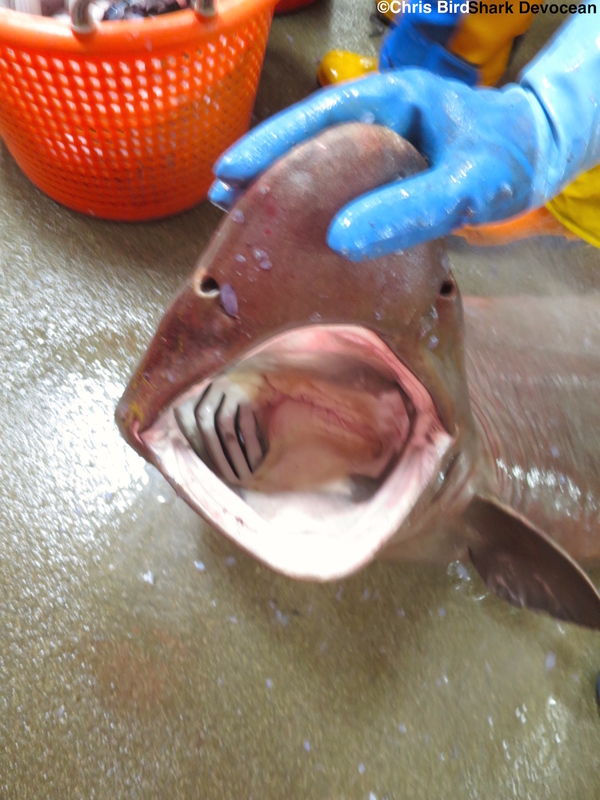 Initially seeing a large body of grey, many of us assumed it would be the quite common bluntnose sixgill shark. As the individual got closer to us however, I could see that the shark had the distinctive dorsal fin of an extremely rare shark. It was a false catshark, Pseudotriakis microdon. I’d only ever seen drawings of this shark and to see such a big one on board was amazing. Measuring in at a massive 2.5m and 60kg, this huge shark took three of us to handle. The shark was very strong and very much alive. We took our measurements and photos as quick as we could before returning the giant alien sofa into the ocean. The shark could have only been in the fish house for 3 minutes. Water was pumped over the gills of the sharks while we took important biological measurements. 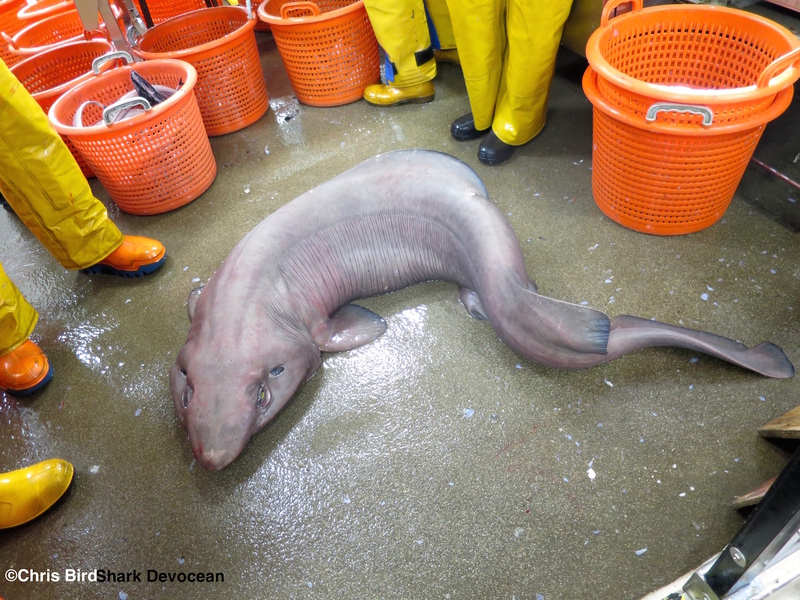 The false catshark is found around the world between 100m and 1890m (We caught this female at 750m). For such a large shark however, this shark had almost no visible teeth. 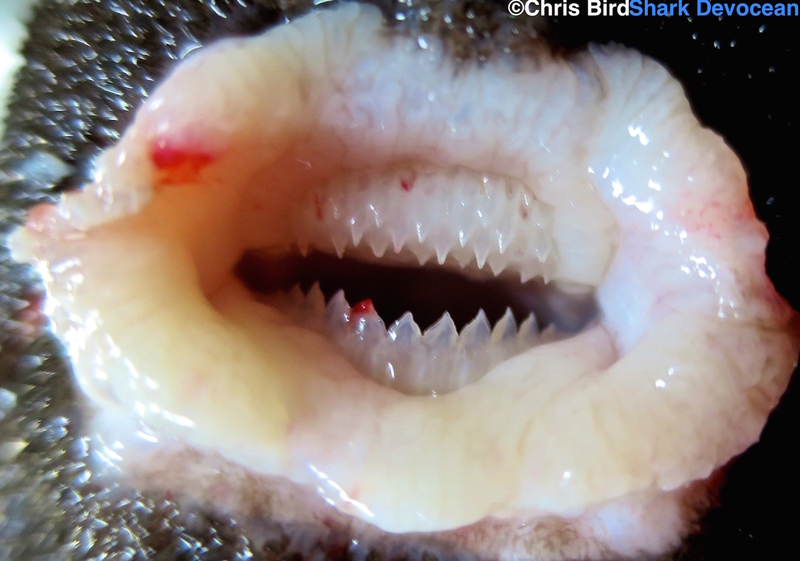 The teeth were smaller than the skin cells of the sailfin roughshark!! From the size of it’s mouth, I can only assume this shark would just swallow its prey of fish and squid whole. This shark shot to fame overnight with press outlets around the world reporting on its bizarre discovery and the nickname “Sofa shark” was born. To be at sea for only a couple of weeks and encounter two extremely rare sharks was very lucky. 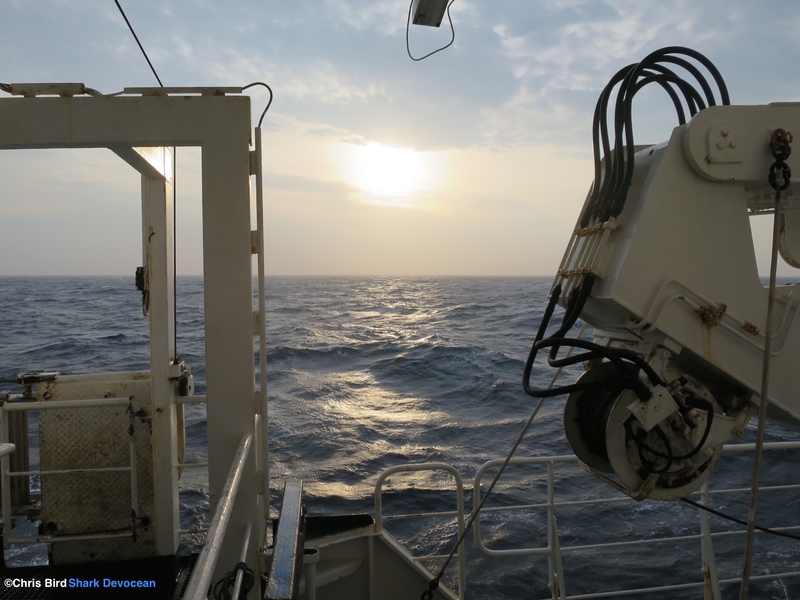 It was a reminder of how many mysteries the deep-sea still holds. Yes, we know these species exist, but aspects of their behaviour, biology, movements and abundances are still a complete mystery. It truly illustrates how exciting the deep-sea is and as our abilities to explore the deep increase, so will our understanding of some of the most enigmatic sharks on the planet. Our scientific work up and photography was done as quick as possible before the shark was released back overboard. 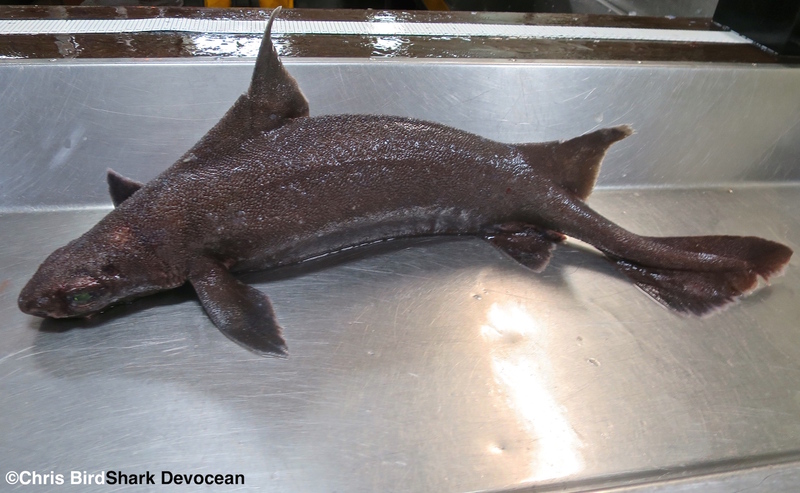 Stay tuned for my next article on the more common species of sharks encountered in the deep-seas of Scotland, with the next article covering the wonderfully diverse deep-sea dogfish. The sofa shark and I.
I’m sure it goes without saying but I have to check: you put the sharks back unharmed, right? Never even heard of that shark. What sort of research do you do? Do have published articles? I’m a phd student at the University of Southampton researching the trophic and spatial ecology of deep-water sharks.